The Suzuki Talent Education Partnership (STEP) has been serving families in Greater Springfield and Northern CT since 2002. 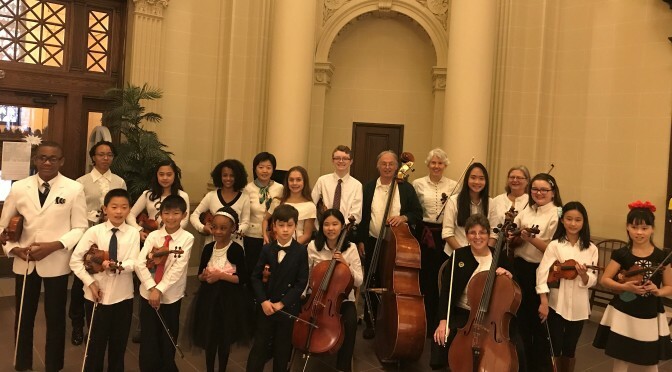 Our performance group, the STEP Suzuki Strings, is a multi-generational ensemble comprised of STEP teachers, parents, alumni, friends and students aged 4 to adult. Audiences are always impressed and inspired by the high quality of STEP performances, honed through hours of individual practice with parents, teachers and students working together to master technical and musical details, and then rehearsed in our Wednesday group classes, where we refine each piece until it’s concert-ready. We perform the core Suzuki repertoire along with a wide range of supplemental pieces, including classical masterworks such as Lani Bortfeld’s arrangement of the 1812 Overture by Tchaikovsky, below, international folk music, Celtic and fiddle tunes, hymns and spirituals, movie themes, Latin, swing, blues and jazz.